Standing on the top of Breithorn, our easy ascent for the first day, we took in some of the incredible route which lay ahead of us. 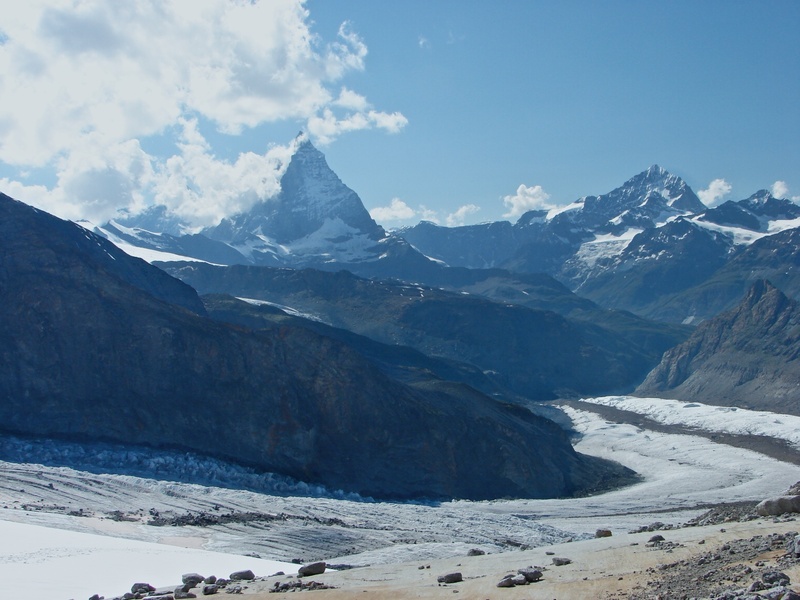 We were in the Pennine Alps above the mountain town of Zermatt at the beginning of our five-day glacier walk and peak-bagging adventure. 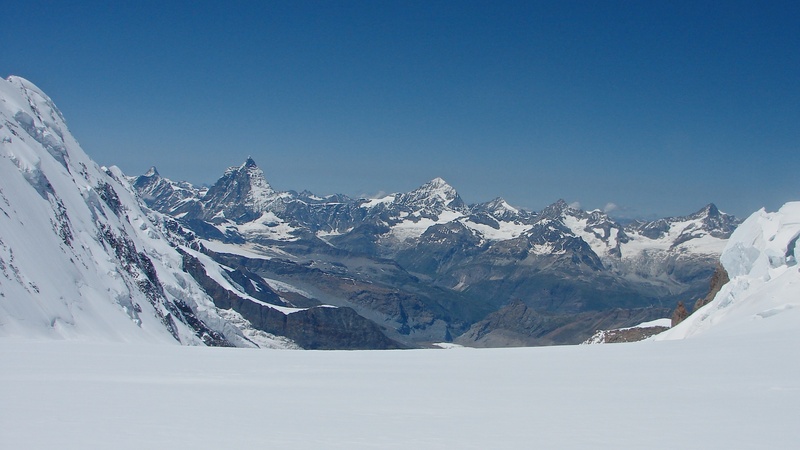 We would be following the Swiss-Italian border from the Klein Matterhorn to Monte Rosa. 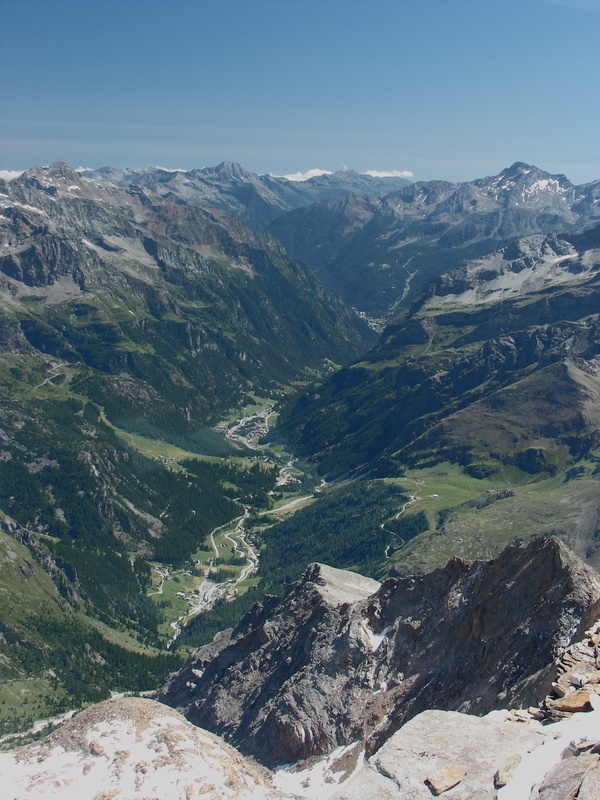 In terms of the sheer concentration of 4000-meter peaks, there is no other section of the Alps as impressive as this. 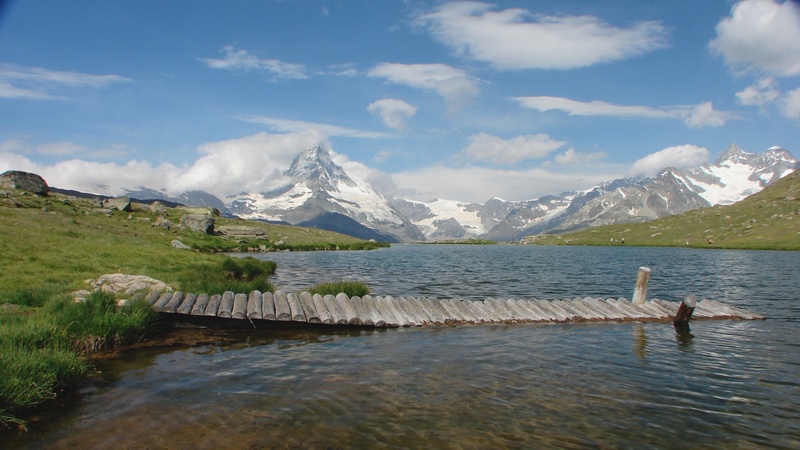 While Mont Blanc may be the single-highest peak at 4,810 m (15,781 ft), Monte Rosa is not too far behind at 4633 m (15200 ft) m and, unlike western Europe’s highest peak, is in the company of many peaks almost as impressive. 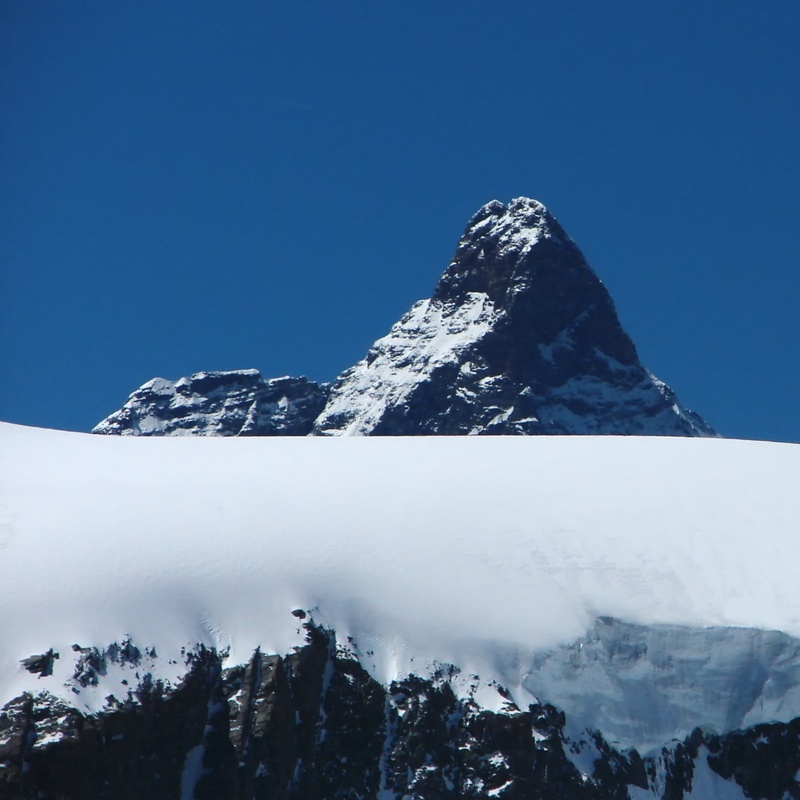 Day One – from Zermatt to Klein Matterhorn by cable car and then a walk across the glacier to the Val d”Ayas hut (Rifugio Guide della Val d’Ayas) after a walk to the top of Breithorn. All images enlarge with a click; all blue text leads to more info with a click! 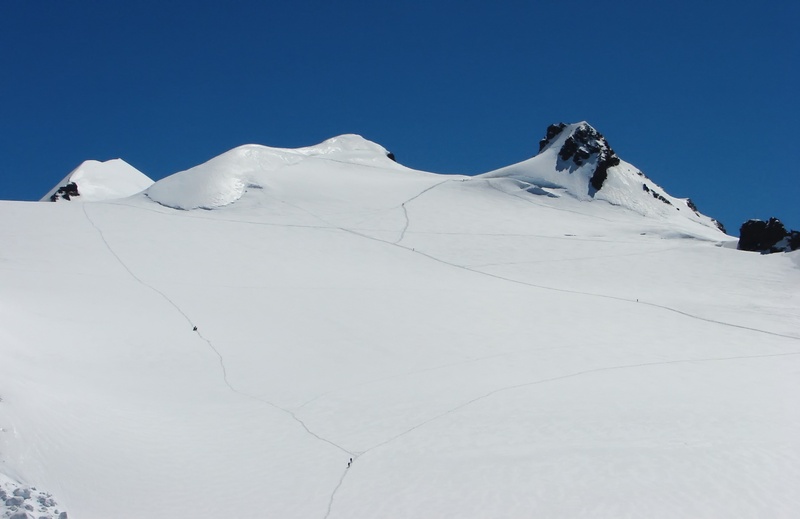 Day Four – Mantova Hut to Margherita Hut (Rifugio Regina Margherita) which sits on top of Signalkuppe. 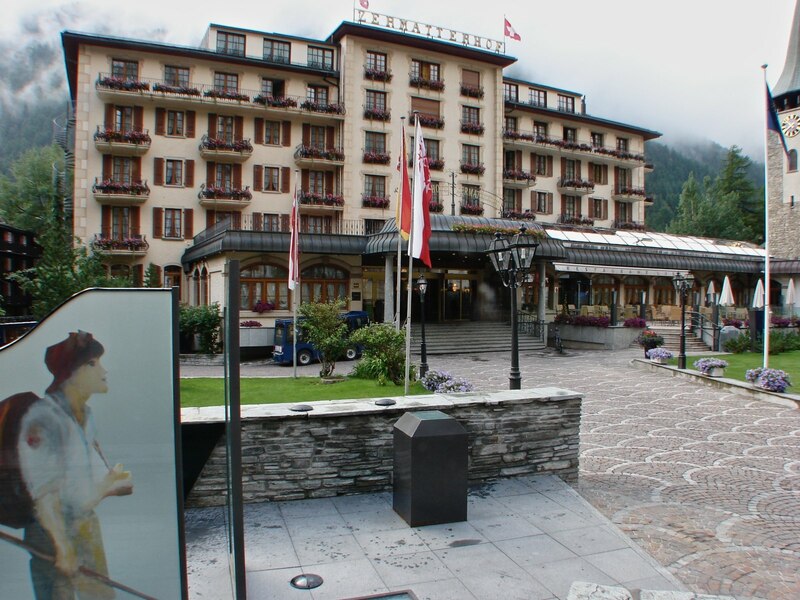 Day Five – the ascent of Dufourspitze, the highest of Monte Rosa’s peaks, and then a descent to Rotenboden where we catch the train back to Zermatt – very civilized! One great feature of the traverse is the fact that as high as you walk each day the rifugios will all be at the lowest altitude for that day – this makes for easy acclimatization. There is one exception! 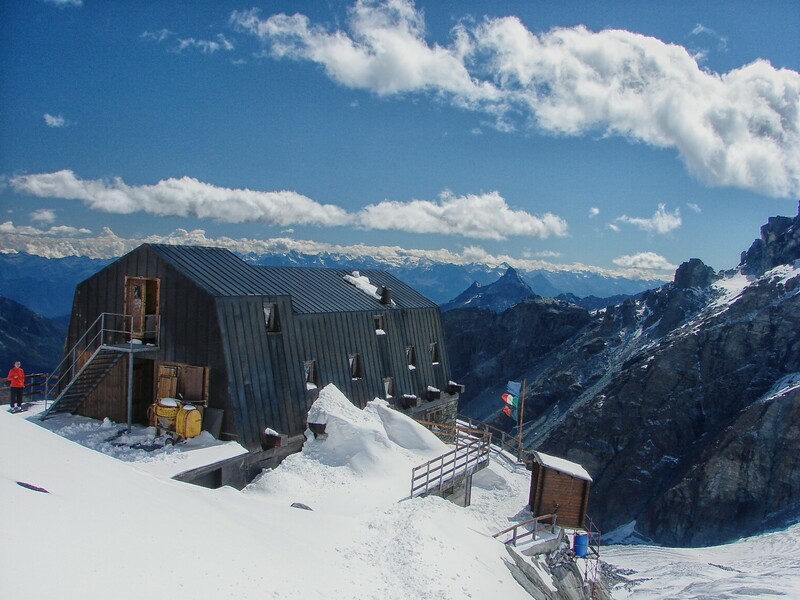 On Day Four you get to sleep at the Margherita Hut, the highest inhabitable building in western Europe. 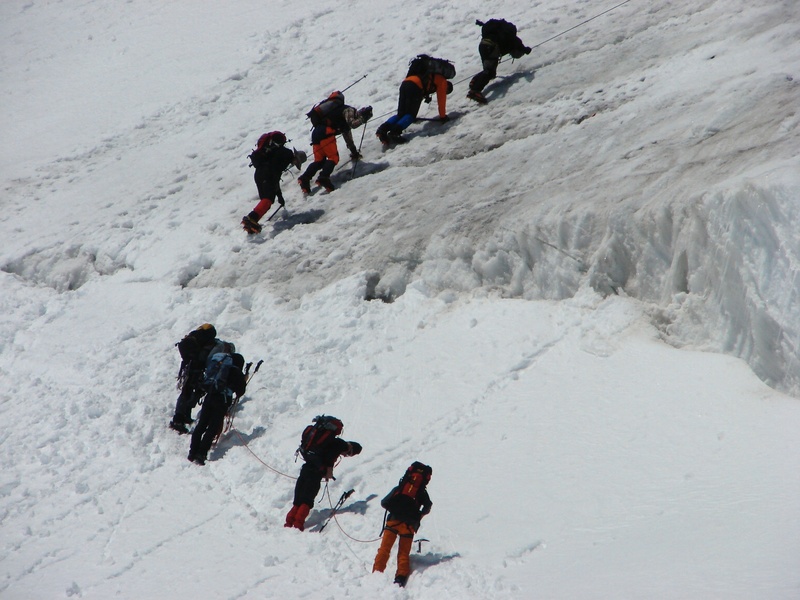 By then, most people will have acclimatized and can handle the 4554 m altitude. The above outline was the plan. As is sometimes the case, the cards we were dealt led to something a bit different! Already, as we tagged the top of Breithorn, the snow was falling and the wind was picking up. Read on and find out how things unfolded. There were seven of us in the climbing team, including our two guides. All but one of us were Canadians. 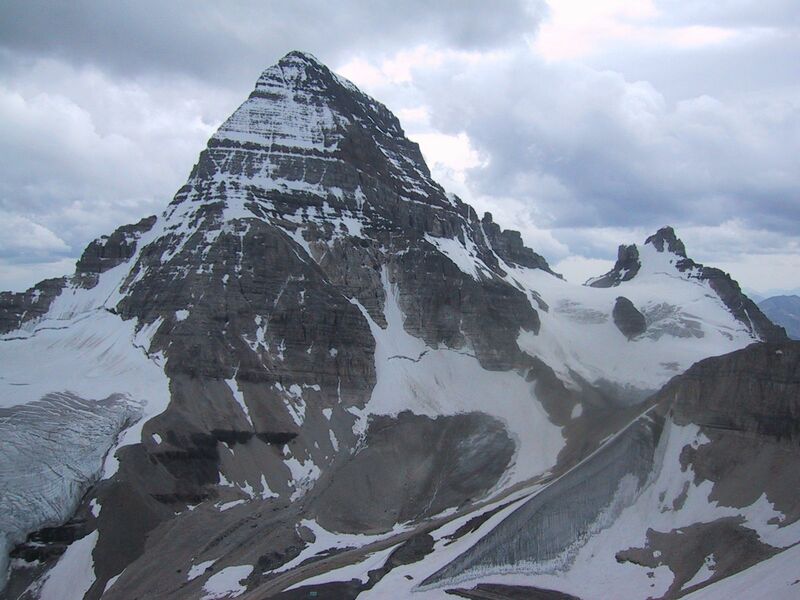 In summers past we had done some climbing together in the Purcells and the Rockies with the ascents of Bugaboo Spire and Mount Assiniboine in 2005 having been our peak bonding experience. 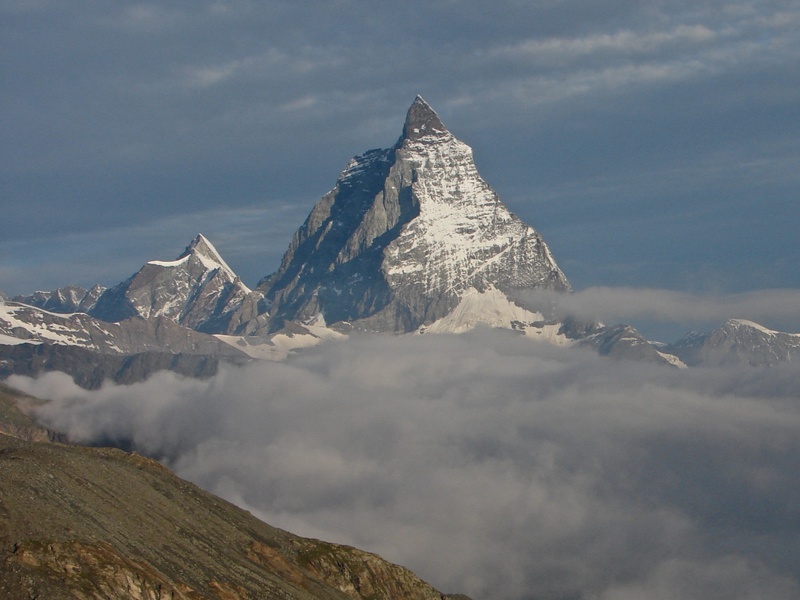 Mount Assiniboine is sometimes compared to the Matterhorn, and now we were here to take a look! 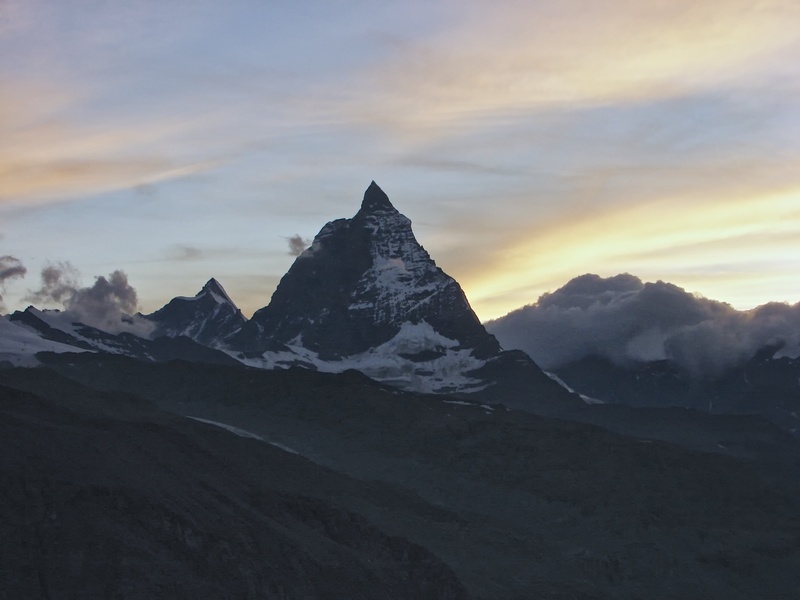 Photo of Mount Assiniboine on the left and an early morning shot of the Matterhorn from the Monte Rosa Hut – there are similarities! 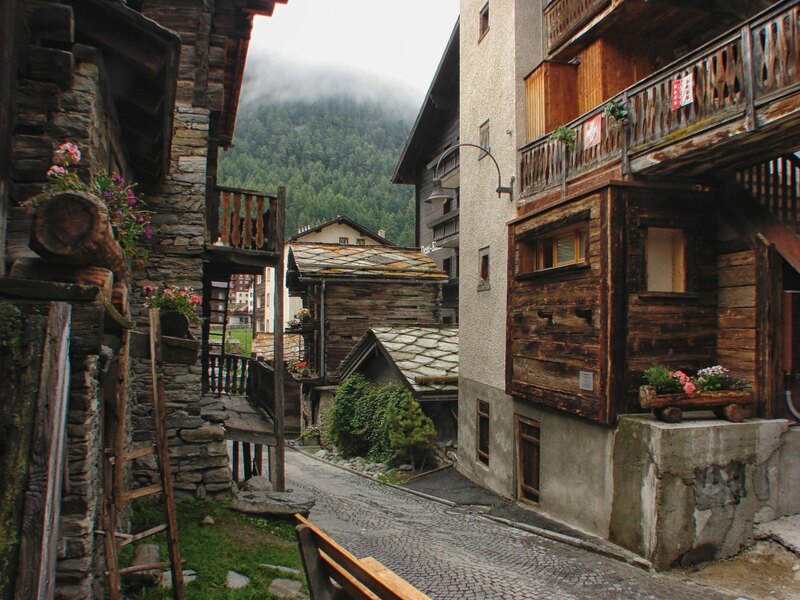 The mountain town of Zermatt – altitude 1620 m/ 5310 ft – sits at the top of the Matter Valley (or Mattertal in German). 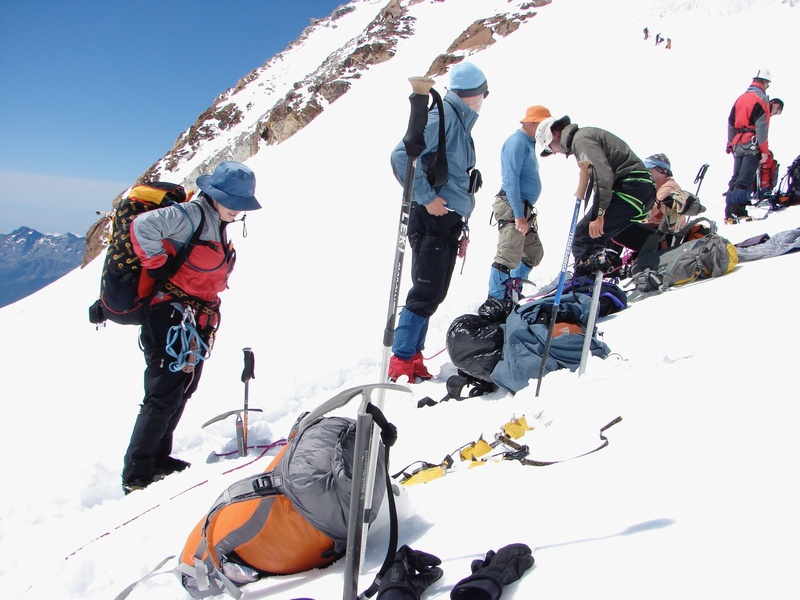 The year-round population of about 6000 lives on tourism and offers various levels of accommodation and hiking, mountaineering and skiing adventures to the hordes who visit both summer and winter. An overnight flight from Toronto to Zurich brought most of us to Switzerland. 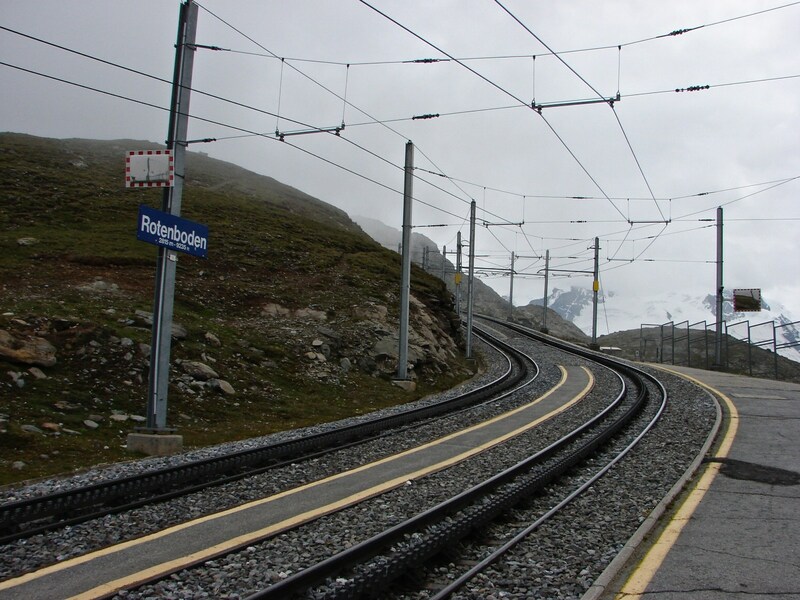 We would get to experience the legendary Swiss efficiency from the very start; the airport and rail services are integrated to the point that you step off the plane and onto the train. 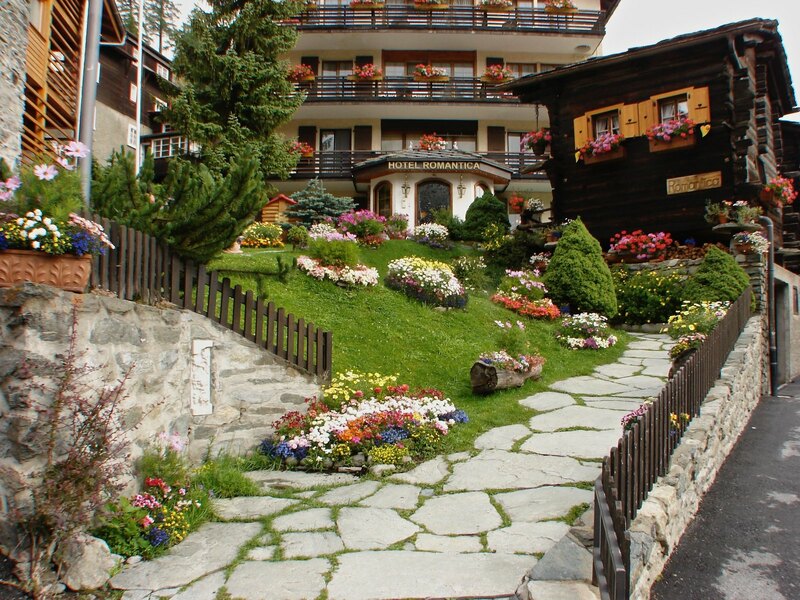 It takes about four hours to get to Zermatt from the airport. 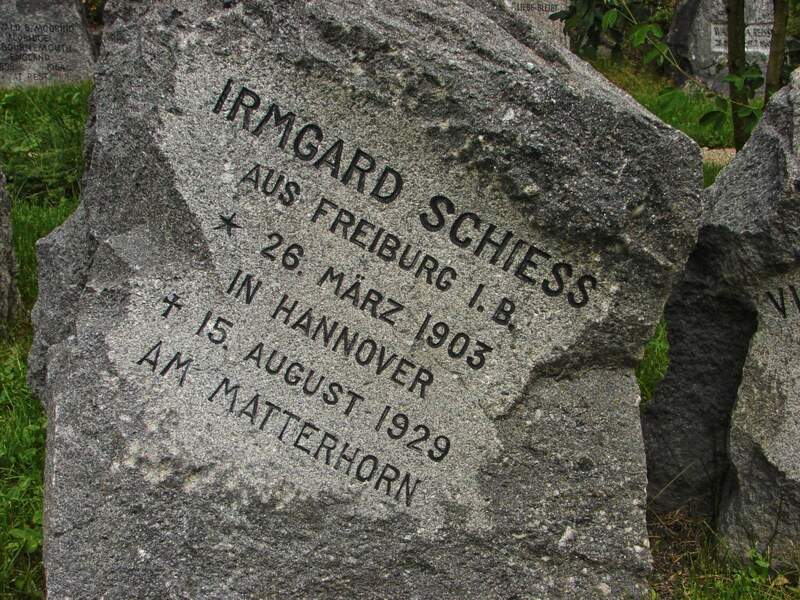 In our case, we caught an IC train that went through Berne towards Brig. Getting off at Visp, we took a local train up to Zermatt and an hour later we were at the main train station in this almost-car-free town. 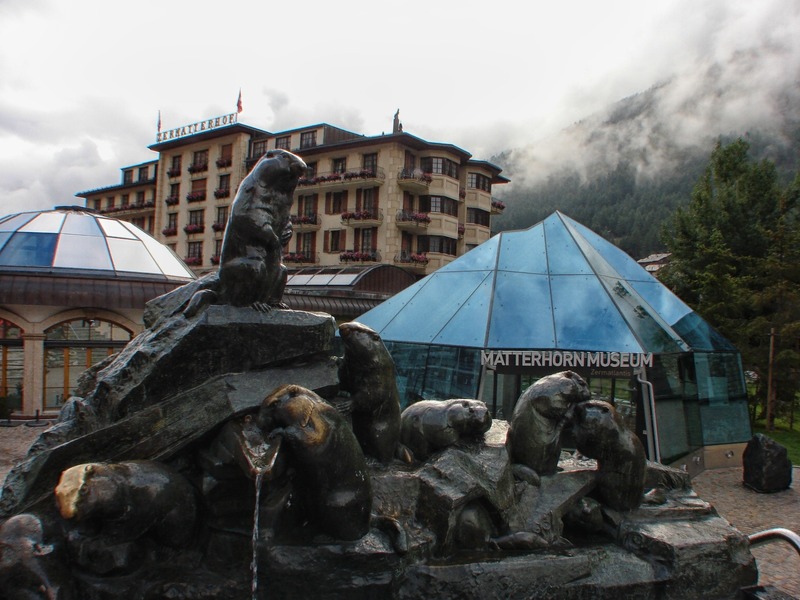 Zermatter Grand Hotel – a good address but a bit pricey! 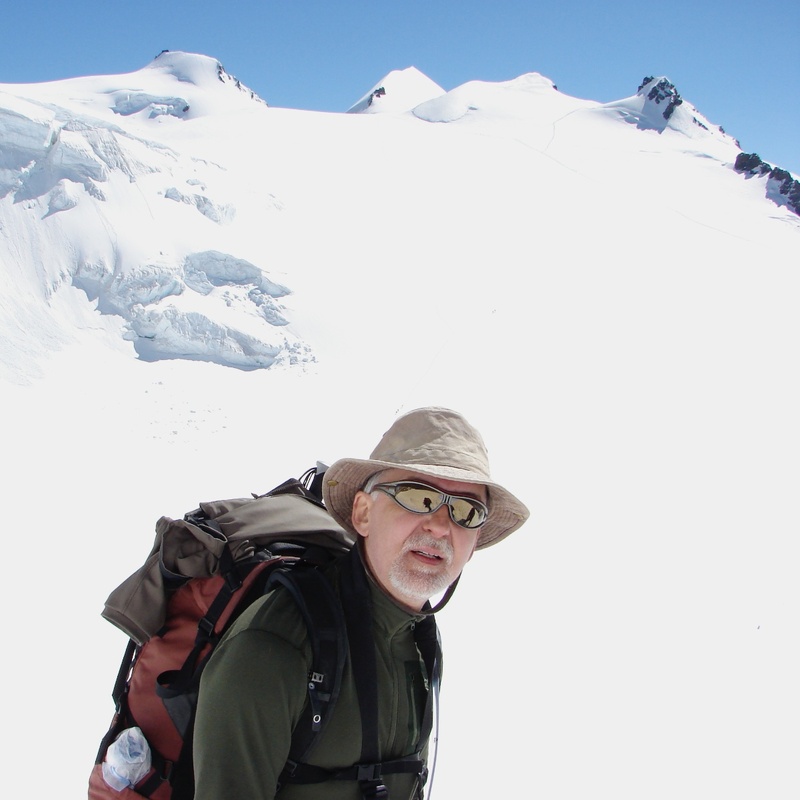 We arrived on a Thursday afternoon and had a couple of days to adjust to the higher altitude- I had come not far from the shore of Lake Ontario at 110 meters/360 feet! 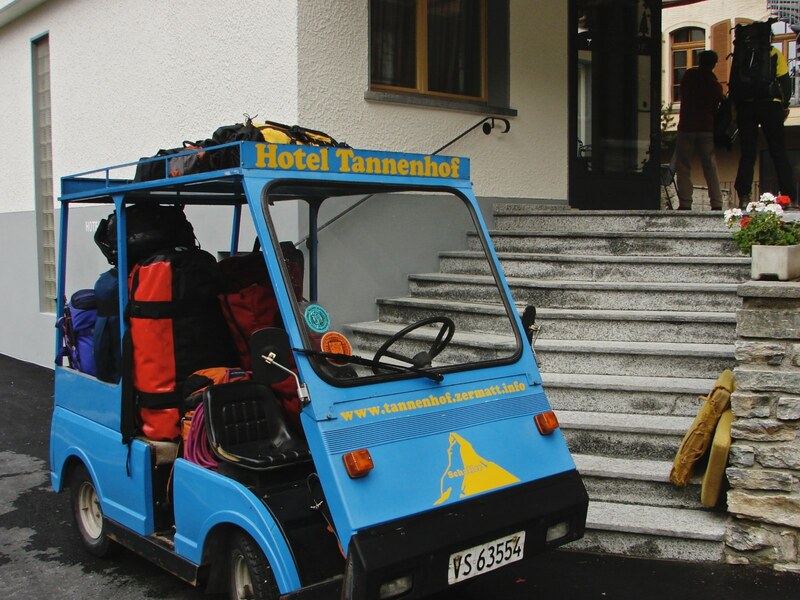 Basecamp for our stay would be the Hotel Garni Tannenhof, a simple, moderately-priced, and totally acceptable place. 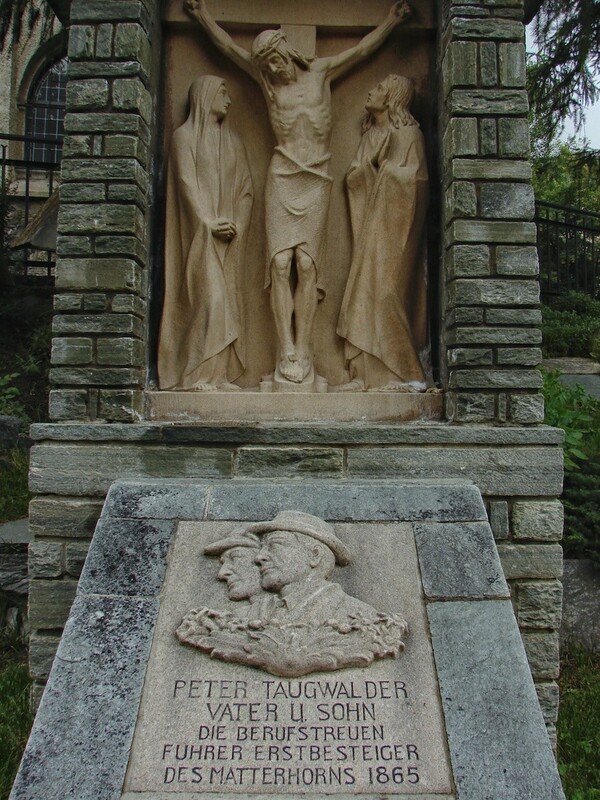 It is located just behind the decidedly more upscale Zermatter Grand Hotel. 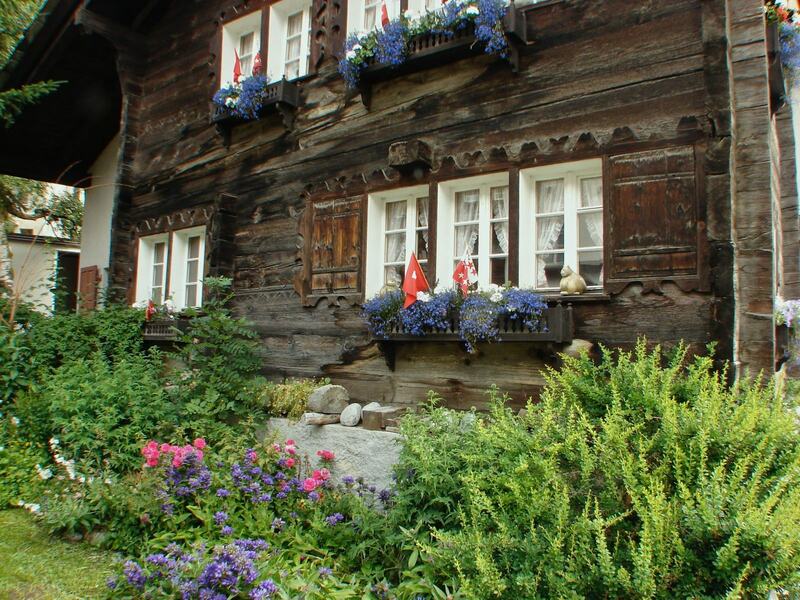 We’d spend two nights at the Tannenhof before the traverse and one night after our return from the Gorner Glacier and the train ride from Rotenboden. We had breakfast there each morning, then put together a store-bought sandwich lunch to take along on our acclimatization hikes, and for supper sampled a few of the many restaurants. More than once I missed the range of vegetarian dishes that a decent Toronto eatery would offer; it just does not seem to be a part of the European geist – Germanic or other. 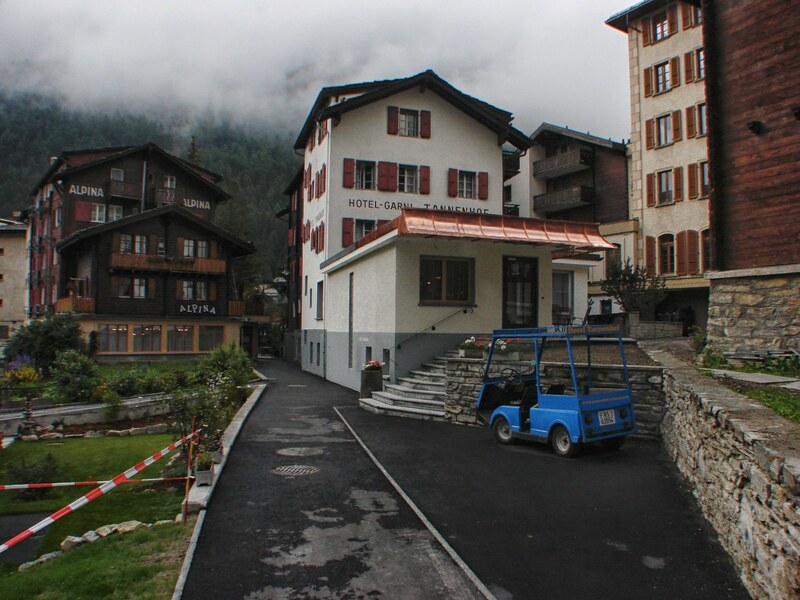 Hotel Garni Tannenhof – our “base camp” in Zermatt. The cart hauls baggage to the train station. “Walk high, sleep low” is a mountaineering principle which we would follow for the next two days as our bodies got used to functioning at altitude. 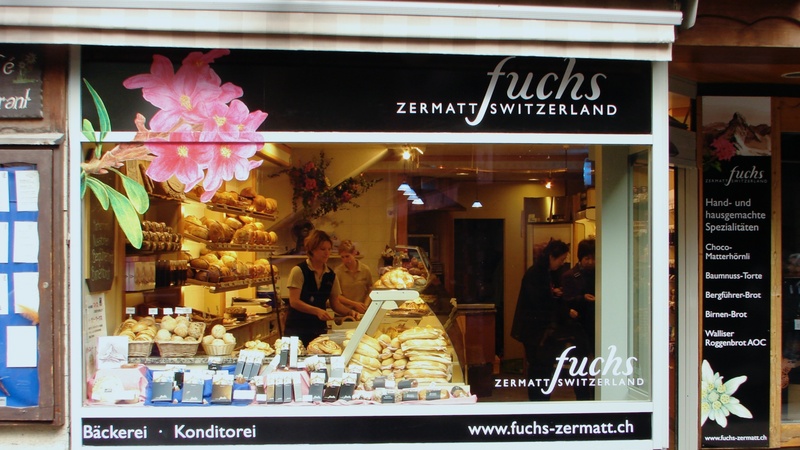 We would start each day off with a visit to Fuchs bakery for buns, cakes and juices and then take the train ride to Blauherd station. Four or five hours went by quickly as we walked the many trails which go up higher, making many stops to admire the view, frame a photo, or to reach into our packs for a bite to eat. 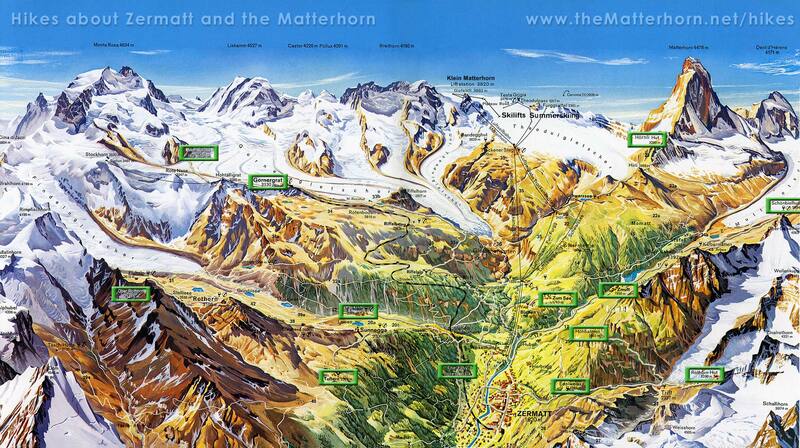 The map above shows many different hiking possibilities in the hills above Zermatt; it also gives you a good idea of the traverse itself – just follow the peaks from Klein Matterhorn on the top right all the way over to Monte Rosa on the top left and then down to the Roteboden trail station and you have the “spaghetti traverse”. If you have Google Earth installed on your computer, click here for the download of Cosley & Houston’s useful kml map of the traverse. Use the Google app to open it – and zoom in or out to get various views. 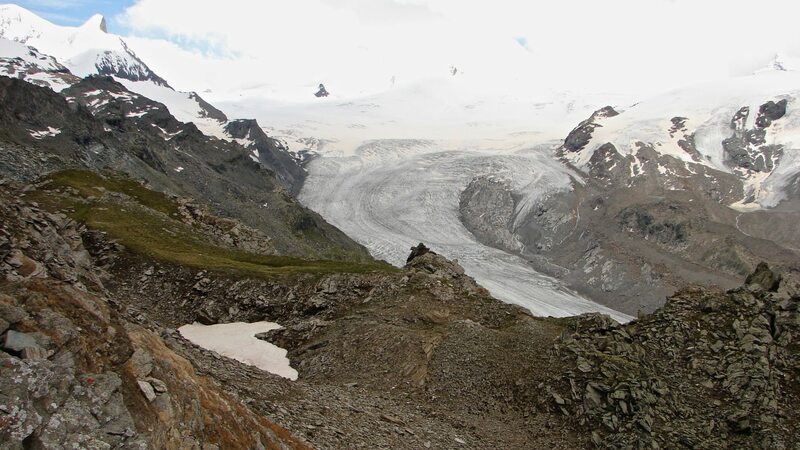 of our walk across the glacier to Monte Rosa began with a one-hour ride to Klein Matterhorn, the small peak you see sitting next to the Matterhorn itself in the photo at the beginning of this post. The Matterhorn Express gondola ride passes through Furi to the mid-station at Trockener Steg and then we transferred to a cable car that carried us right up to Klein Matterhorn, about 60 meters from the actual summit. 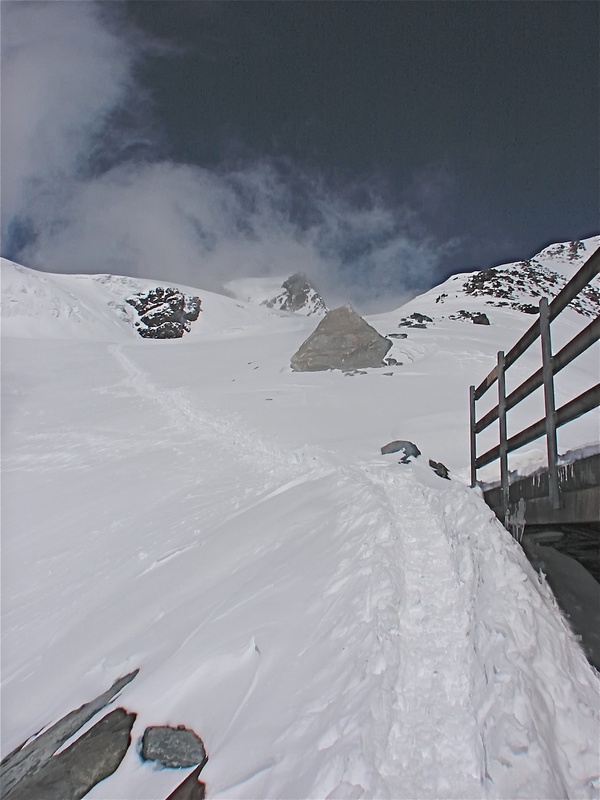 There is an elevator which takes you to the observation deck on the very top; we walked through the tunnel and onto the glacier instead, keen on putting on the crampons and getting our “spaghetti traverse” started. 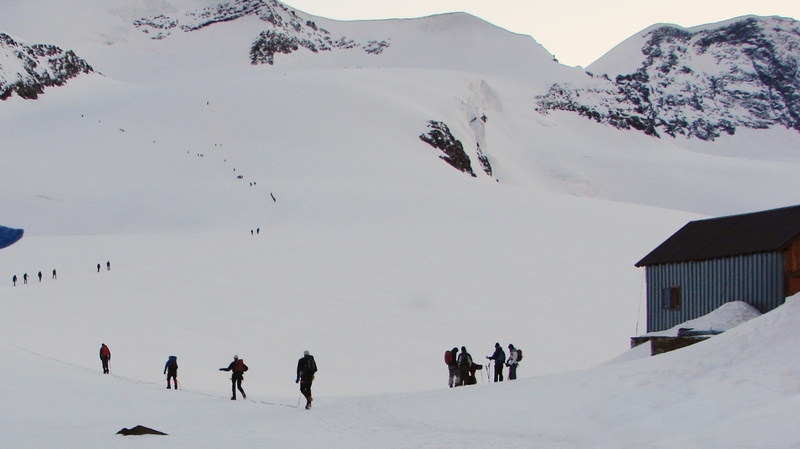 Breithorn was essentially an uphill snow slog and we got to follow well-trampled trails. But then the weather started to deteriorate and by the time we got back down to the plateau, we were facing blowing snow. 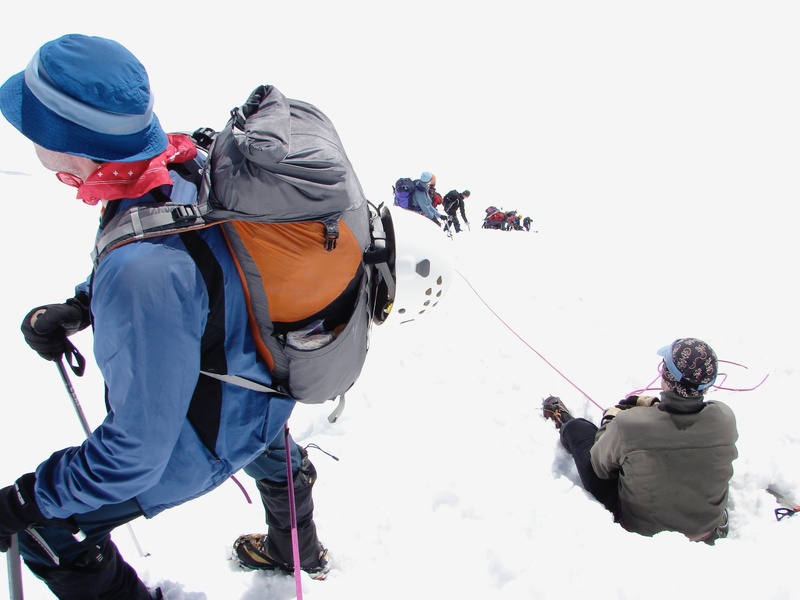 In fact, we would spend the next three hours in near-whiteout conditions as our guides’ skills were tested to the limit. I guess that’s the thing about mountaineering in the Alps; you can be sitting in the town square in the morning and right in the middle of a full-out mountaineering challenge four hours later! “Walking inside a ping-pong ball” is the image that comes to mind. 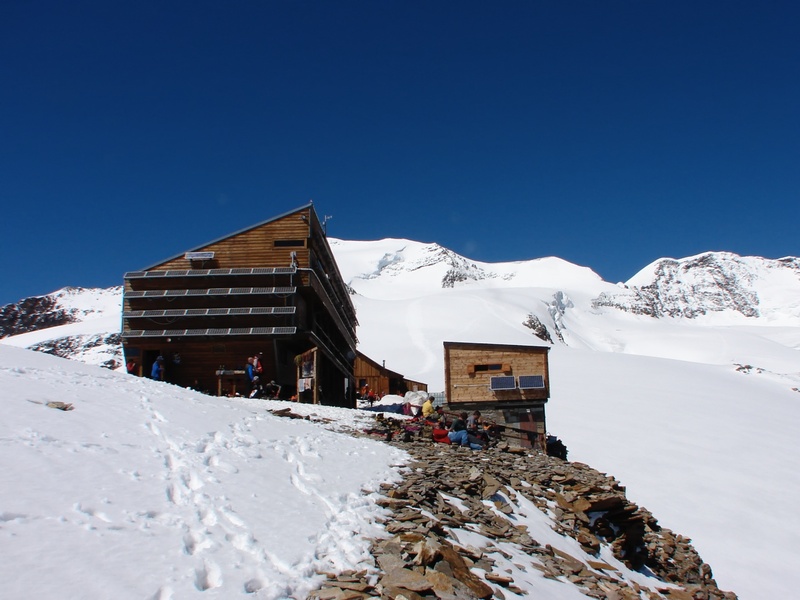 We did make it to the Vald’Ayas Guides’ Hut about three hours after descending Breithorn and were hauled back to the luxury of an Italian-style mountaineering hut…beer on offer and great (non-vegetarian) Italian food. I poured the contents of one of my boil-in-the-bag Indian curry meals on top of a plate of spaghetti. The next morning things didn’t really look much better – it was still blowing hard. We did pack up and follow the trail some others had already stamped down as we made our way back up to the plateau. 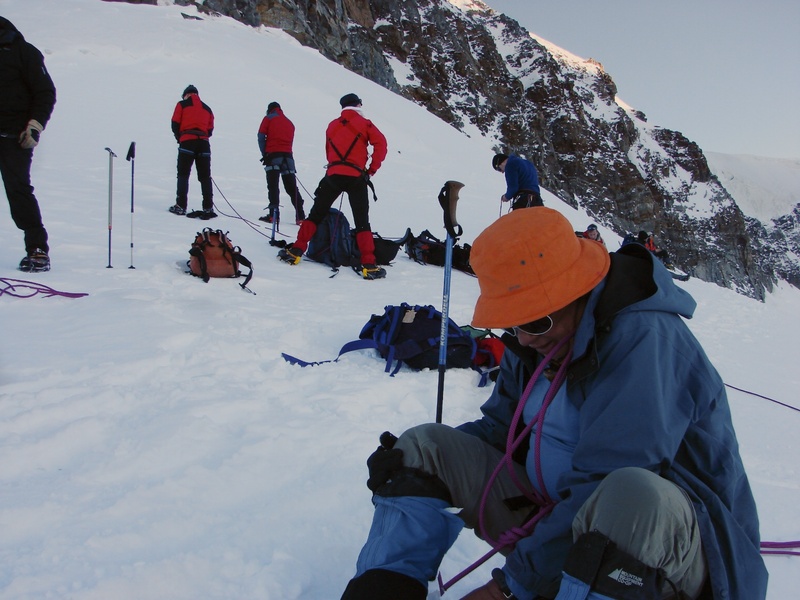 However, an hour or so later we decided the conditions were such that we’d have to pass on an ascent of Castor and that another night at the Ayas Hut made more sense than aiming for the Quintino Sella hut. So back to the Ayas hut we went for night #2. We left the next morning for the Sella hut, pictured below, arriving at about 3 p.m. after a windy morning that gave way to sunshine and a clear afternoon. 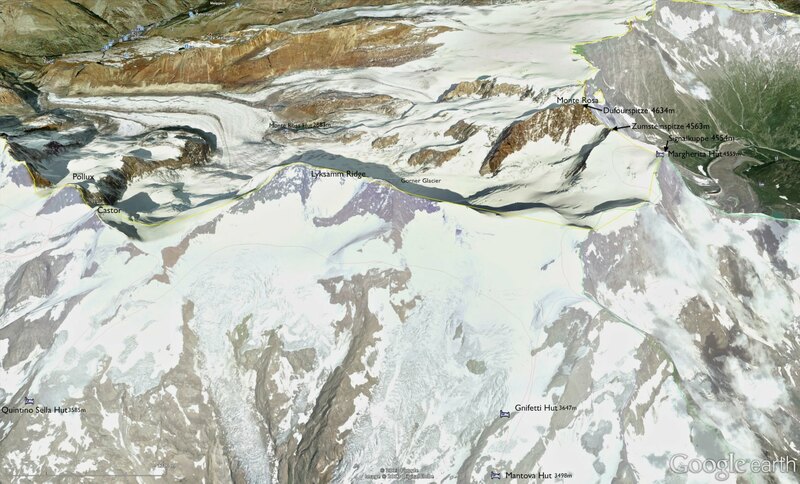 (See the above Google satellite map for the relative locations of the Ayas and Sella huts.) My camera sat in the pack for the day so pix are scarce. I have since realized that the way to go is to have a small p&s that you can quickly pull out of your chest pocket during the day. 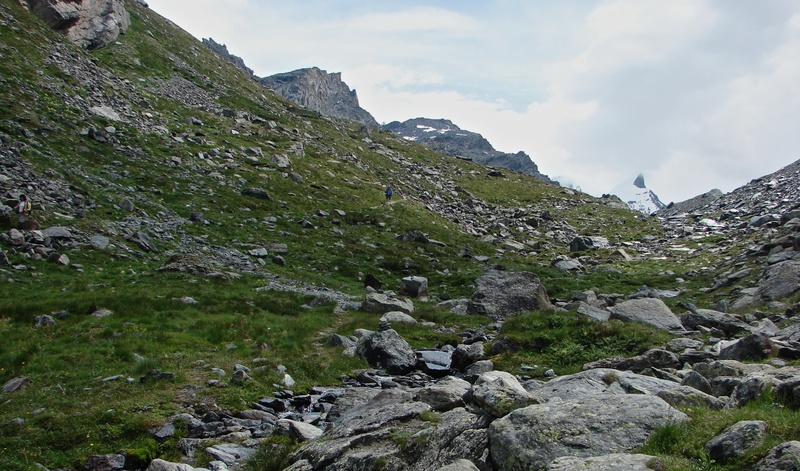 Quintino Sella hut – our home for Day 3 – we were one day behind schedule! The Google map below shows three four Italian huts – the Sella, the Mantova, the Gnifetti, and the Margherita. The objective for Day Three is usually the Mantova or Gnifetti huts with the Margherita the goal for Day Four. Since we had lost a day thanks to the weather, we were now faced with a long day which would take us from the Sella hut to the Signalkuppe (one of Monte Rosa’s many peaks but not the main one) on top of which the Margherita Hut is located. By 2:00 on Day Four we were sitting below the Monte Rosa massif, the series of peaks which culminate with Dufourspitze, the highest point in Switzerland. 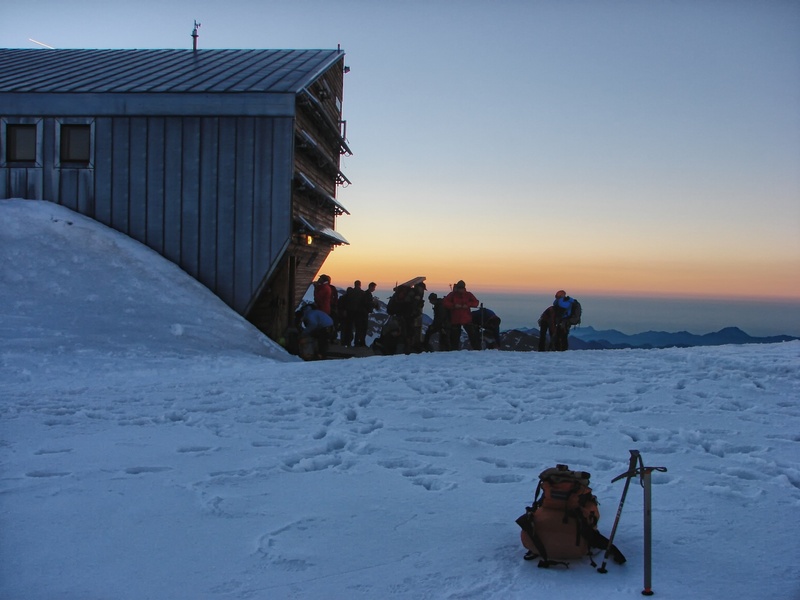 The usual approach is to get to the Margherita Hut in the afternoon, spend the night in the highest inhabitable building in Europe, and then do Dufourspitze the next morning. 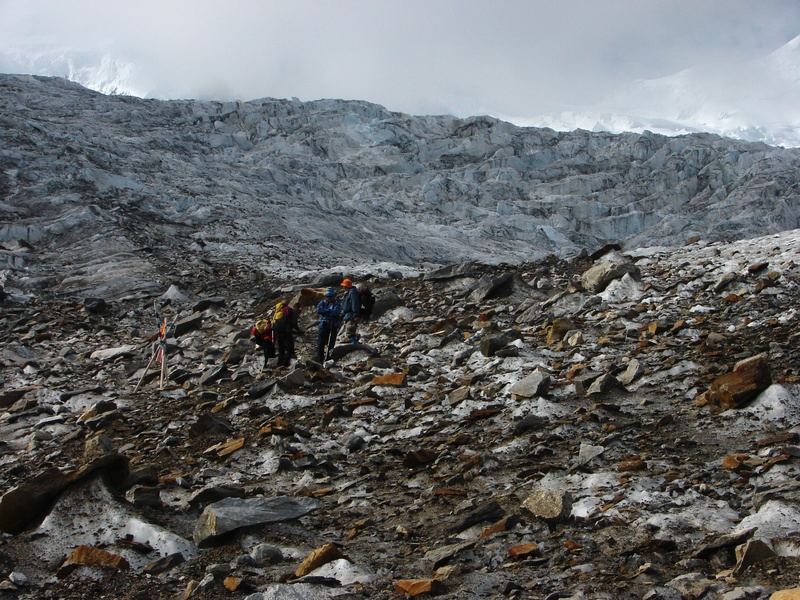 Unfortunately, we would not be getting to the Margherita Hut; the weather seemed to be turning for the worse and the general consensus was that there was no point in going up to the hut only to have to descend in possibly bad conditions the next morning. I put forward the minority position of at least going up to experience the hut for the night. 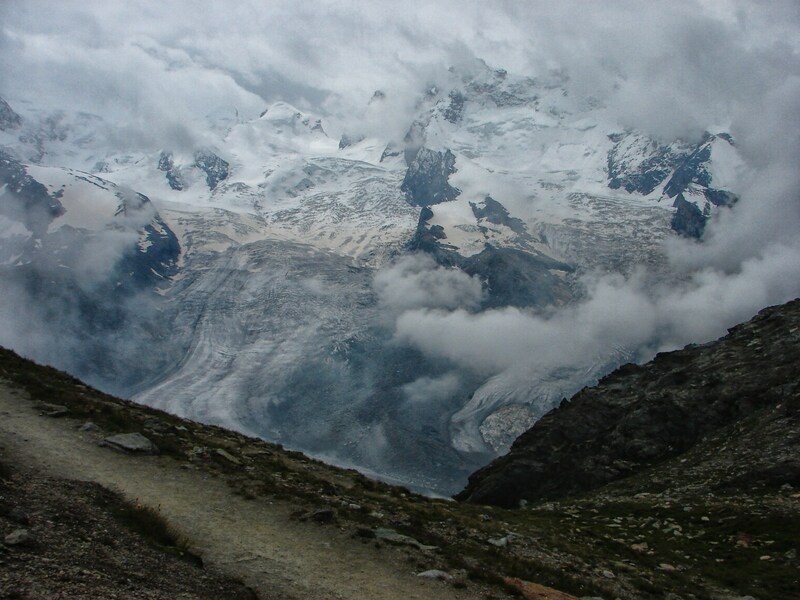 In the end, the decision was made to head for the Monte Rosa Hut, about a three-hour walk down the Gorner Glacier. So down we went – our Monte Rosa traverse was all but over and we had been treated to some incredible scenery over the past four days. However, our traverse had been pretty much a disappointment in terms of, as Abraham Maslow once put it in his hierarchy of needs, “peak experiences”. 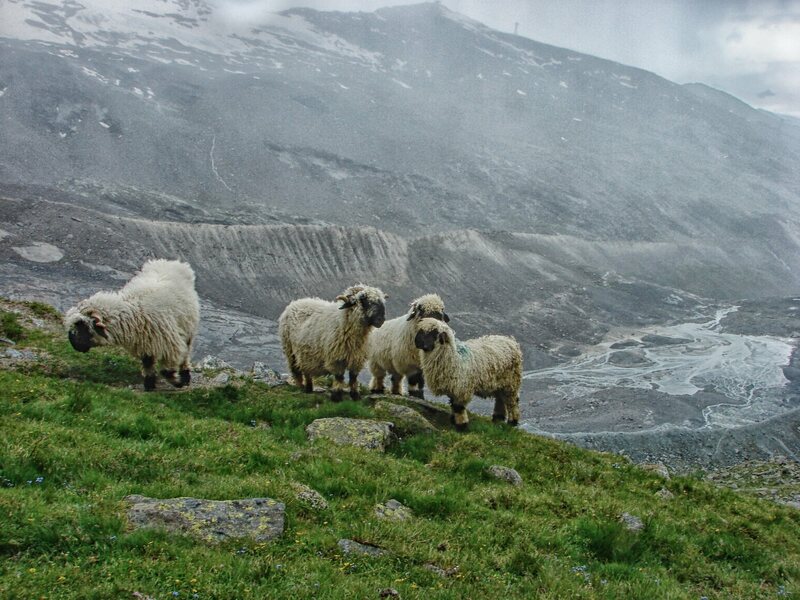 Thanks to the weather, we came, we saw, and we went back down empty – but safe – to Zermatt. 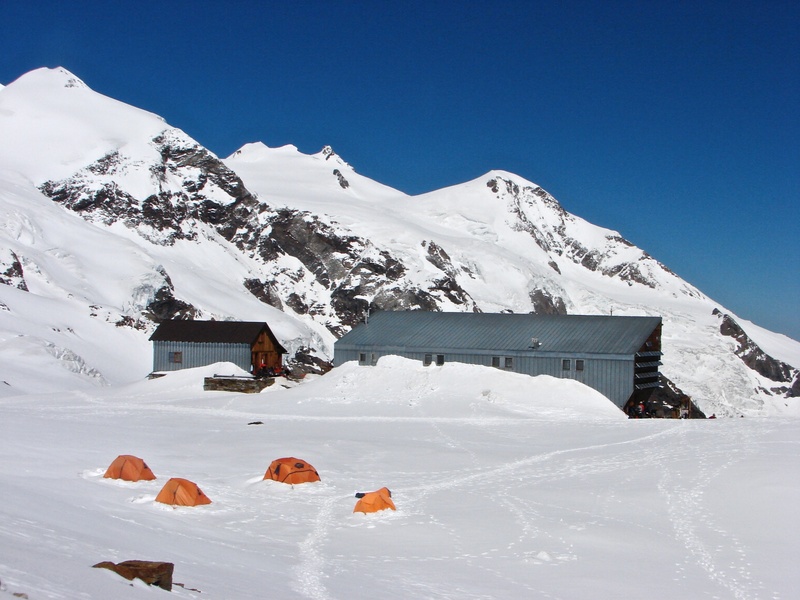 We got to the Monte Rosa Hut around 5:00 and after a relaxing night set off the next morning for the Rotenboden train station a bit further down the glacier. 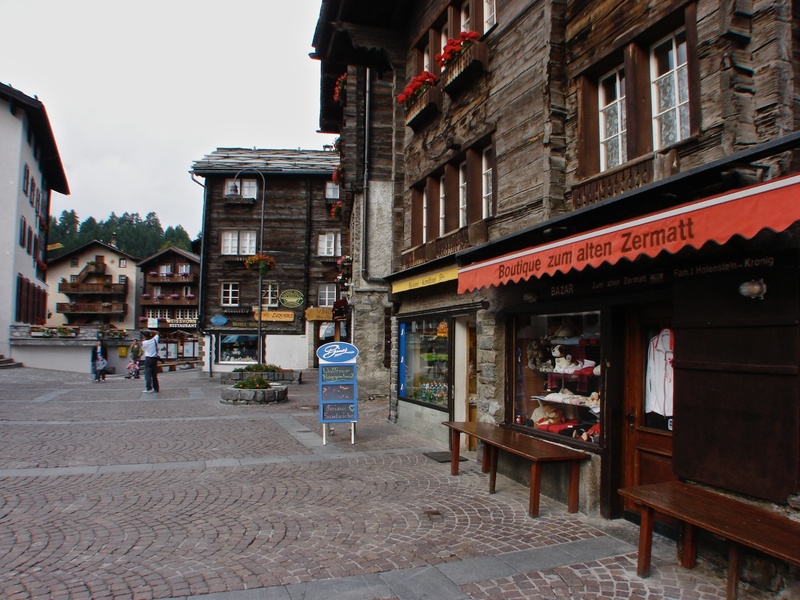 shortly after noon we would be back in Zermatt, swallowed up by all the other tourists as we walked along Bahnhofstrasse (literally railway station street in English) looking for a lunch spot on an outdoor patio. 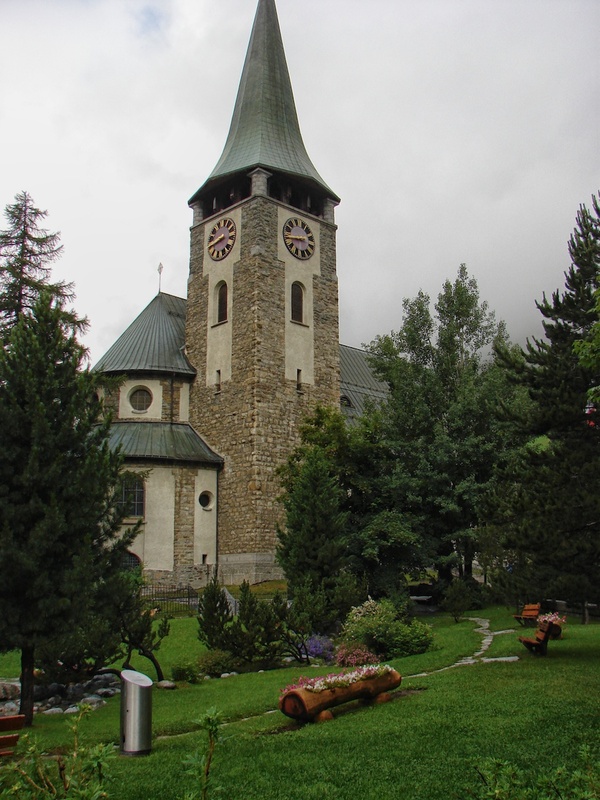 We had a spare day to spend in Zermatt. I got up quite early and wandered around the town – I love being up and experiencing the emptiness when most people are still in bed. It was overcast for the entire day with low hanging clouds. We really hadn’t been blessed with much decent weather during the week we spent in Zermatt and up above on the glacier but it was still a beautiful place to be. I sometimes think of going back to see if I might have more luck on a second attempt at the Spaghetti Traverse! 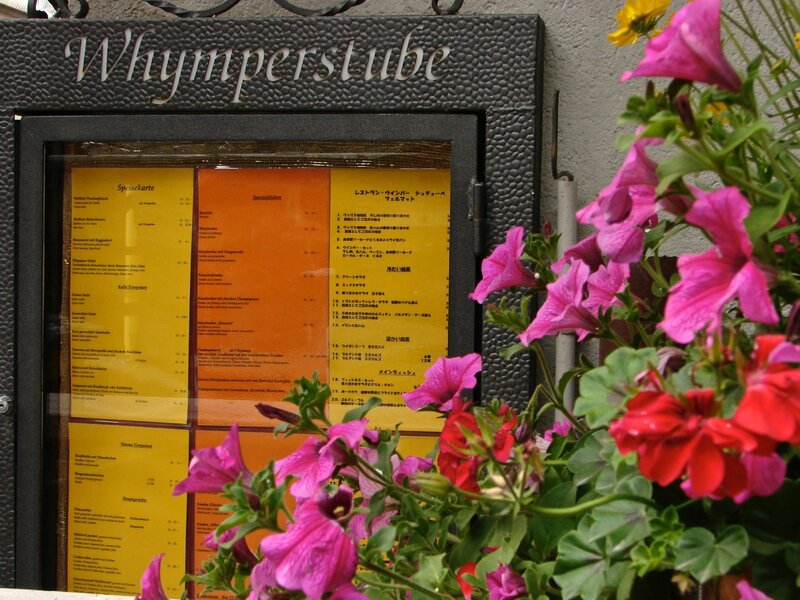 We checked out a number of restaurants and in the end the traditional Swiss option – the Whymperstube and their fondu special – won out. I’ll admit that fondue is not my favourite meal choice – I try to stay away from eggs and cheese products as well as meat. However, I did order the simplest fondu and benefitted from the savoir-faire that a few of the others seemed to have when it came to the proper way to do fondu! 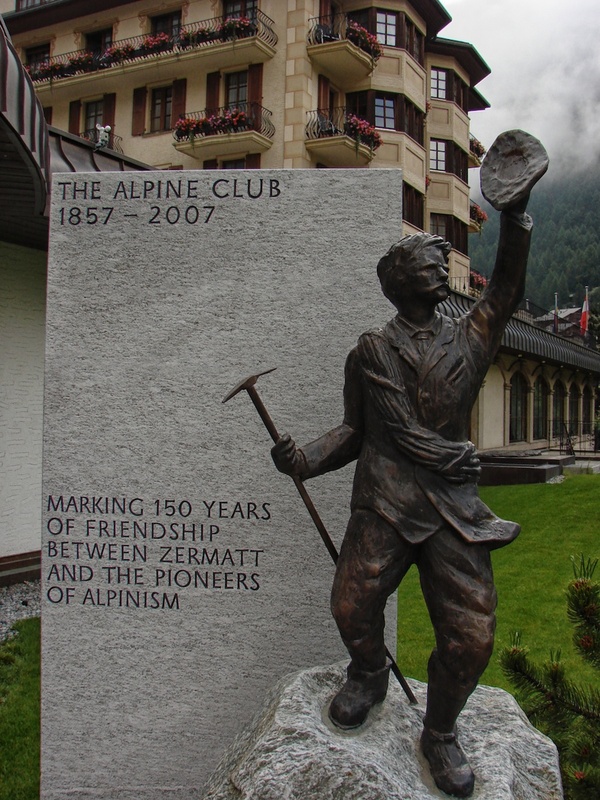 From the menu, I learned that Whymper was the first person to climb the Matterhorn (in the company of local guides) and he would later climb elsewhere in the mountain world. A couple of years later I would stay in the 5000-meter Whymper hut on the side of Ecuador’s Chimborazo and thought back to this Zermatt restaurant! 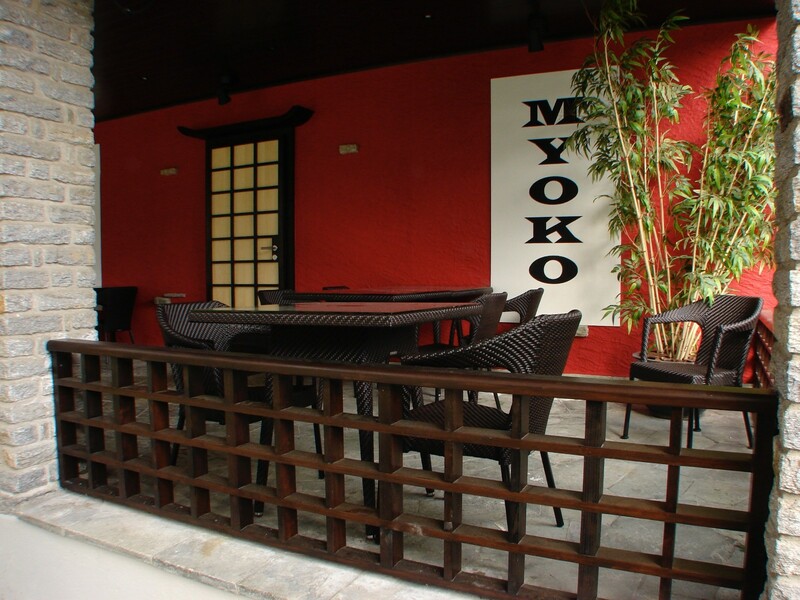 Noted was the fact that the menu is written in German and Japanese – a good indication of the importance of Japanese visitors to the local hotels and restaurants and high-end shops. 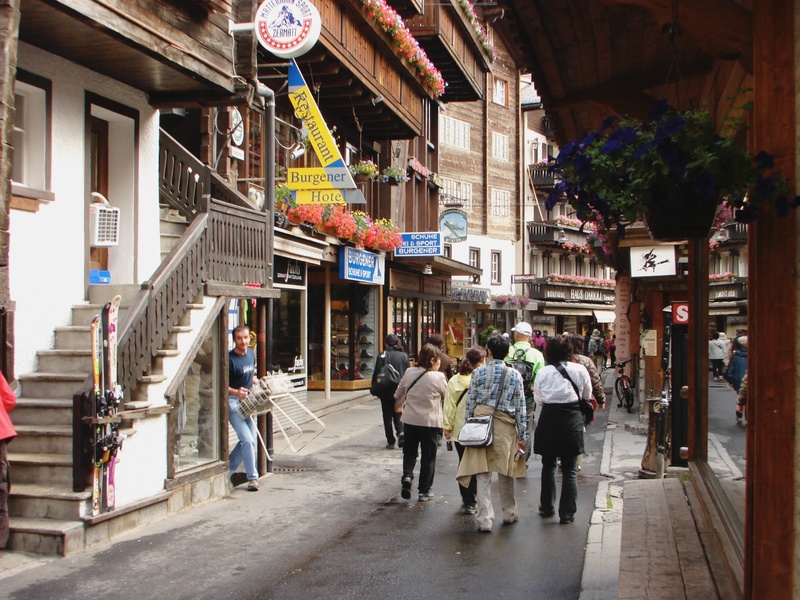 The Japanese seem to find something very simpatico about the Swiss – they do indeed share more than a few positive national traits! The Tannenhof cart with our gear – time to move on! We left Zermatt by train for Tasch where we met a van that I had arranged to take us to Chamonix across the border in France. 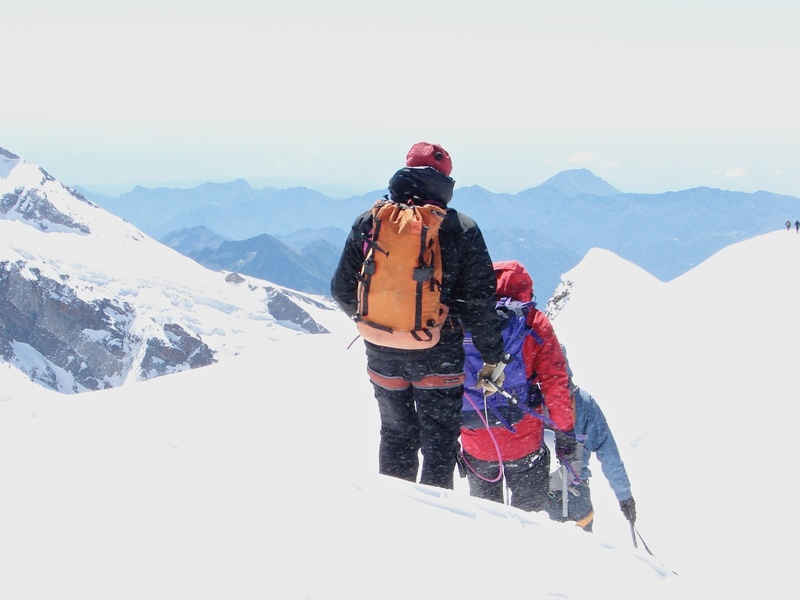 By mid-afternoon, we had moved from one centre of alpinism to another and were staring up at our next big objective – the summit of Mont Blanc, the highest peak in western Europe. 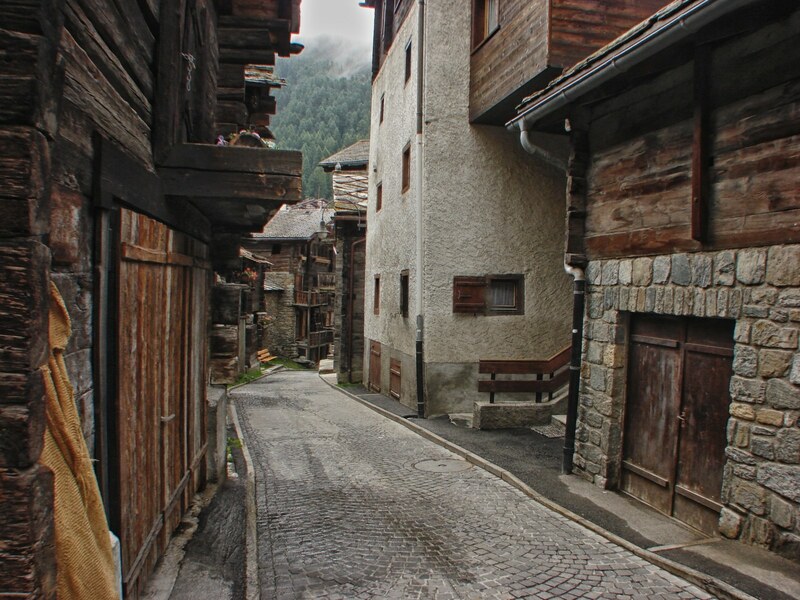 A future post will take a look at the town at the bottom of the mountain and the eighteen-hour traverse that we did from the Cosmique Hut to the Gouter Hu after a couple of days of rock climbing in the mountains nearby. Stay tuned! 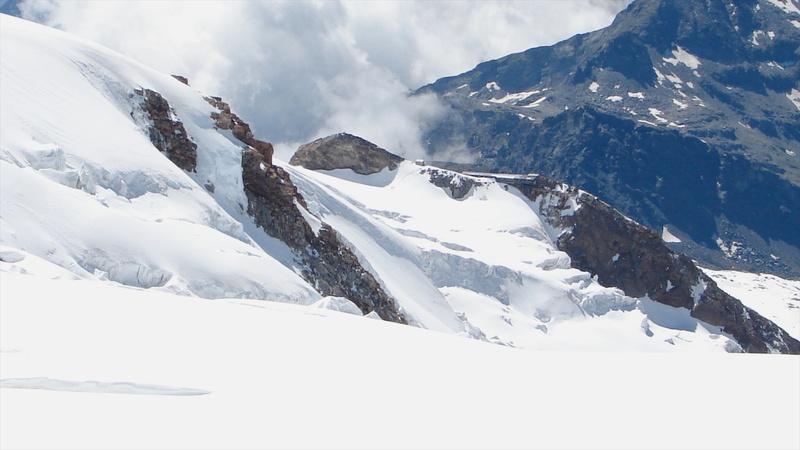 Check out this Mountain Madness web page for one of the many standard offerings of the Monte Rosa Traverse. It follows the usual five-day itinerary and the price is at the high end of what you can expect to pay if you go through a guide service. I might mention that our group was made up of two guides and five clients. For our five-day traverse, we each paid $2000. and this included everything but the meals. This was in 2008. It is obviously way cheaper if you go with two clients on a rope instead of 1:1. Another guiding company, Cosley & Houston, also has a description of its itinerary here. Their price is about 60% of what Mountain Madness is asking. If you’ve got the Google Earth app installed, they have a kmz file of the traverse which will give you a great idea of the terrain. See here for the link to the map. 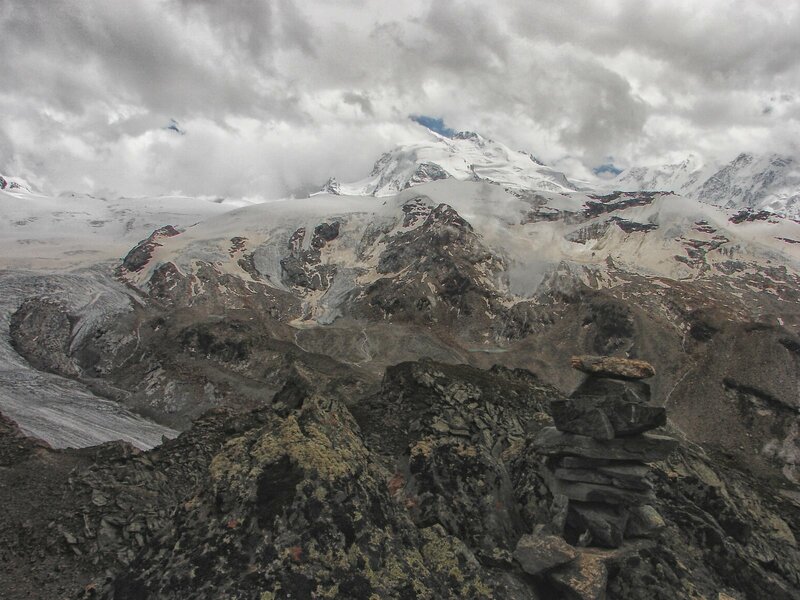 Summitpost.org has a brief report of a group which did the entire traverse in three days and included ascents of Breithorn, Pollux and Castor, a traverse of Lyskamm, a night at the Margherita Hut, and the ascent of Dufourspitze. See here for the details. 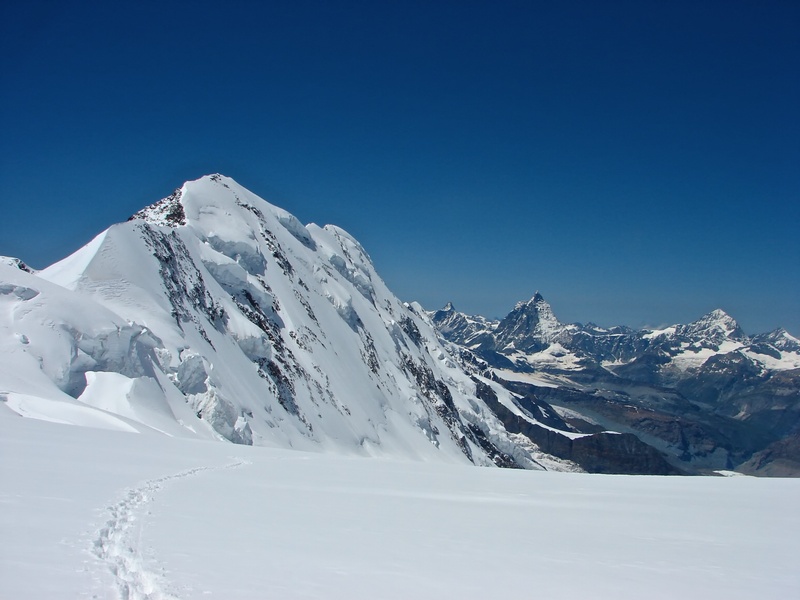 This entry was posted in mountaineering and tagged Ayas Hut, Klein Matterhorn traverse, Monte Rosa Hut, Monte Rosa traverse, Quintino Sella Hut, Rotenboden train station, Spaghetti Traverse, Tannenhof Hotel Zermatt, Zermatt mountains. Bookmark the permalink. 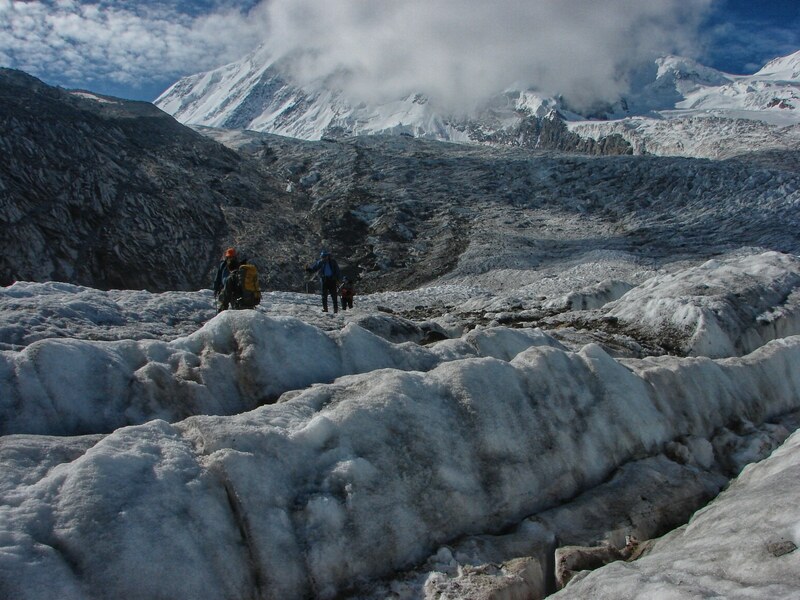 Nepal's Annapurna Circuit: Is It Still Worth Doing? Eastern Ontario Bicycle Tour Plan: Toronto to Ottawa via the Side Door! The Olive Hut on the east edge of the Catamount Glacier in British Columbia, Canada. Dambulla, Sri Lanka - detail of seated Buddha in Cave 1.